The driver will offer a lower rate per km (normally 45-55LKR) but will have a minimum required distance per day which can be cumulative over the entire period of hire. So if the driver charges a minimum or 100km per day and you complete 800km over 10 days, the charge will be for 1000km, not for 800km. 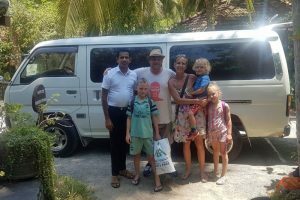 In addition you will be required to pay for the driver’s accommodation and evening meal, which if not included by your hotel could be as high as 2000-3000LKR depending on where you are and whether it is high or low season. The average daily cost is between 50 and 60USD per day. Use our Trip Cost Calculator to calculate a cost for your exact itinerary. Generally this is the cheapest method unless you plan on travelling only small distances or significantly resting at each stop where you will be paying the driver to do nothing.